Chrysanthemum parthenium (L.) Pers., Pyrethrum parthenium Sm. She lus 'sy chynney Asteraceae eh bossan Pheddyr (Tanacetum parthenium). V'eh dooghyssagh da'n yn Euraishey (Lieh-inshey Valkanagh, Anatolia as y Choagaash) agh t'eh skeaylt harrish y teihll jiu. T'eh ry-akin 'syn Oarpey, America Hwoaie as yn Çhillee. T'eh gaase dys crouw wheesh as 46cm er yrjid. Va ymmyd jeant jeh myr losserey lheeys noi çhiassaghey, çhingyssyn king as gailley. Ta cooid vreeoil bossan Pheddyr goaill stiagh parthenolide as tanetin, as melatonin. Foddee eh cur aawoalley allergagh ort, goaill stiagh gorley craitnagh coventyn, çhingys gailley, as askaidjyn beill. T'ad cur coyrle n'oi rish torraghys. ↑ Jeffrey C (2001). Tanacetum parthenium. Mansfeld's World Database of Agricultural and Horticultural Crops. ↑ Pittler MH, Ernst E (2004). "Feverfew for preventing migraine". Cochrane Database of Systematic Reviews 1 (CD002286). doi:10.1002/14651858.CD002286.pub2. PMID 14973986. ↑ "Two cases of compositae dermatitis exacerbated by moisturizer containing feverfew" (2007). Dermatitis : contact, atopic, occupational, drug : official journal of the American Contact Dermatitis Society, North American Contact Dermatitis Group 18 (4). PMID 18021604. ↑ Yao M, Ritchie HE, Brown-Woodman PD (Houney 2006). 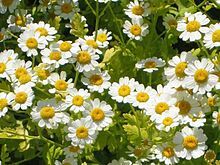 "A reproductive screening test of feverfew: is a full reproductive study warranted?". Reprod. Toxicol. 22 (4). doi:10.1016/j.reprotox.2006.04.014. PMID 16781113. Ta tooilley coadanyn mychione Tanacetum parthenium ry-gheddyn ayns Wikimedia Commons.